Sat., April 28, 2018, 5:20 p.m.
Steve Hertz is “Mr. Baseball” at Gonzaga University. His name is woven throughout the school archives as a player and coach. A bronze bust of his likeness has greeted fans in the courtyard area of Patterson Baseball Complex and Washington Trust Field since its dedication in 2007. And now the facility in which he never had the opportunity to coach will carry his name as well. Gonzaga athletic director Mike Roth made that announcement in pregame ceremonies on May 11, saying the school will rename the stadium Patterson Baseball Complex and Coach Steve Hertz Field Presented by Washington Trust. The Zags will play New Mexico State at 6:05 p.m. The renaming ceremony will take place at approximately 5:30. “We are looking forward to dedicating the baseball field to a great Zag that poured his heart and soul into the baseball program and athletic department for decades,” Roth said. 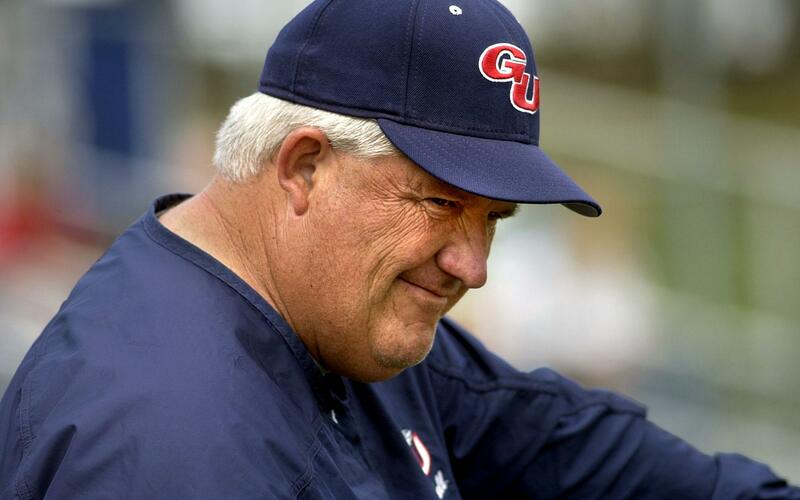 Hertz, who is retiring from Gonzaga athletics in July after 39 years of professional attachment, served as head baseball coach for 24 seasons, beginning in 1978. He retired as head coach in 2003 and has spent the last 15 years in athletic development, rising to senior associate director of athletics for major gifts. As baseball coach, he compiled a school-record 637 wins, advanced to the NCAA Regionals twice, won three conference titles and was named coach of the year four times. In his first season as head coach, Hertz guided GU to a 33-14 record and within a win of earning a trip to the College World Series. He spent three seasons as a pitcher for then-Bulldogs coach Larry Koentopp starting in 1970. It was Koentopp he would eventually replace in the dugout. Gates will open at 5 on May 11. Tickets are available at GoZags.com/tickets or by calling the ticket office at (509) 313-6000. Three North Idaho College national championship wrestling teams form the Class of 2018 that will be inducted into the school’s Athletics Hall of Fame on May 5 in the NIC Edminster Student Union Building. Teams from 1974, 1975 and 1978 will become the first of 14 NIC wrestling national champions to be enshrined during the eighth induction ceremony. They will join the 1987 women’s national championship cross country team, which was inducted in 2013, in the team category. Coaches of those wrestling teams, Les Hogan (1974 and 1975) and John Owen (1978), were previously enshrined. The induction, which will also serve as a reunion for members of the NIC wrestling program from its start in 1972 through 1979, will be held in conjunction with the annual NIC Athletics Awards Banquet. Athletic and academic award winners for the 2017-18 school year and Booster Club Members of the Year will be honored. The banquet will begin with a social at 5 p.m., with dinner at 5:30 and the awards ceremony at 6. Tickets are available for $30 and can be purchased at the NIC Athletics Department Office in Post Hall. Tickets should be pre-purchased or reserved. For more information, contact the NIC athletics department at (208) 769-3348 or visit the NIC athletics website at www.nic.edu/athletics. Vanessa Shippy, the Oklahoma State senior from Lake City, will continue her softball career professionally after being selected by the Cleveland Comets with the 11th pick of the 2018 National Pro Fastpitch Draft last week. Shippy, a two-time All-American and Academic All-American, owns no fewer than eight school records – she recently broke the record of 58 runs scored – and leads the Big 12 in batting average (.474), on-base percentage (.621), walks (48) and runs (61). She is top 10 nationally in those categories. • Madison Hovren, who turned in another impressive season as a junior at Army West Point, was named All-Met Division I first team by the Metropolitan Basketball Writers Association for the second straight year. The junior forward from Central Valley led the Cadets in scoring (14.6) and rebounding (9.8) for a second consecutive season. She had a league-best 17 double-doubles and seven 20-point performances and ranked fifth in the Patriot League in scoring, third in rebounding and second in shooting percentage (45.1). • Sander Moldau, a Washington State freshman from Estonia, who won the men’s pole vault at the Bryan Clay Invitational with his second lifetime-best mark in as many days, was named Pac-12 Men’s Field Athlete of the Week. One day after clearing a PR 17 feet, 1 inch at the Pacific Coast Intercollegiate Meet at Long Beach, California, Moldau went 17-8 ¼ at the Bryan Clay at Azusa, Calif. It is the fourth-best at WSU all-time, leads the Pac-12, is 12th in the NCAA West Region and 18th nationally. • Community Colleges of Spokane sophomore Micaela Kostescka from Mt. Spokane was named NWAC Women’s Track & Field Athlete of the Week after she set a school and conference record in the 3,000m steeplechase at the Mt. SAC Relays in Torrance, Calif.
“Micaela ran in a fast heat, fell in the water on lap 5, and recovered for a 10-second PR, a school and NWAC all-time best mark,” Sasquatch coach Jason Cash said of Kostescka’s time of 10 minutes, 45.11 seconds. • Whitworth’s Sara Gayer and Hugh Smith claimed Northwest Conference player of the week accolades for their performances during the final week of the softball and baseball regular season. Gayer, a freshman from San Jose, Calif., received the honor in softball after she served as the Pirates’ primary run-producer of the week. She drove in nine runs in four games, including seven while batting .500 as Whitworth ended the regular season with a pair of mercy-run rule wins over Willamette. Smith, a junior from Sammamish, Wash., the NWC Pitcher of the Year, claimed the weekly honor in baseball after turning in his first complete-game victory of the season to improve to 6-1. He pitched a seven-hit shutout, striking out seven and walking two. • Three former Greater Spokane League athletes, two of them at Pacific Lutheran, were named to All-Northwest Conference teams in baseball. Anthony Gosline, a PLU senior third baseman from Gonzaga Prep, and Connor Cantu, a Lutes senior outfielder from Mt. Spokane, were named to the first team. Gosline was a second-team choice as a junior. Alex Jondal, a George Fox senior starting pitcher from Ferris, was named to the second team. • Junior Sophie Whittle (Nipomo, Calif.) led a group of five Gonzaga women’s tennis players who earned All-WCC honors when she was selected first team in both singles and doubles. It’s the third straight season she received the honor in doubles and the second in singles. She was second team singles in 2016. For the second straight season, Whittle shared the doubles spot with junior Graciela Rosa (Mexicali, Mexico), with whom she compiled a 16-5 record in the No. 1 spot. They rank 32nd in the nation. Whittle went 21-5 in singles and ranks No. 71. Junior Nevada Apollo (Las Vegas, Nevada) was second team in singles with a 17-6 record after being first team last season, and the doubles team of sophomore Haruna Tsuruta (Japan) and senior Alex Bourguignon (Seattle), who were 21-6, earned All-WCC honorable mention. • Gonzaga men’s tennis players Ruadhan O’Sullivan from Australia, a junior, and sophomore Sam Feit of Los Angeles were All-WCC in both singles and doubles. As a pair, they were named to the second team with a 13-6 record in the top spot in the lineup. In singles, O’Sullivan, with a 19-9 record that included a 13-3 mark during the tournament season in the fall, was named to the second team. Feit (17-7, 10-4 in the fall) was honorable mention. • Idaho junior Enrique Marin from Spain was rewarded for being the Vandals top player all season by being named to the All-Big Sky Conference first team in men’s golf. Marin, a second-team choice in 2017, tied for a league-best four golfer-of-the-week awards and compiled a 72.6 scoring average. • Washington State senior Alivia Brown (Gig Harbor, Wash.) was named honorable mention on the All-Pac-12 women’s golf team after she compiled a career-low 72.68 stroke average and finished the regular season ranked No. 43 nationally. Brown, who had four top-10 finishes, was selected to compete as an individual in the San Francisco Regional of the NCAA Division I championships May 7-9. • Four Whitworth sophomores have earned second-team spots on All-Northwest Conference teams in men’s and women’s golf based on their performances in the three NWC counting tournaments. Sam Stiles (Mt. Spokane) and Keegan Loo (Hawaii) were honored in men’s golf and Maggie Peters (West Linn, Oregon) and Jaymie Pentony (Union, Washington) in women’s. It was the second honor for Stiles, Loo and Peters and the first for Pentony. Stiles made the first team in 2017, Loo and Peters were on second teams. • Eric Ansett of Spokane, a senior at Lipscomb University in Nashville, Tennessee, is the ASUN Conference Men’s Golf Scholar-Athlete of the Year for a second straight year. It’s the third time on the ASUN All-Academic team for The Oaks Academy graduate who played his high school golf at Ferris. A unanimous all-academic choice, he has a cumulative GPA of 3.52 as a journalism and new media major. The all-academic team recognizes student-athletes who excel both on the field and in the classroom. On the course, Ansett has a 73.07 stroke average, putting together 11 rounds of par or better and his 103 birdies rank eighth in program history. He posted seven top-20 finishes, capped by a tie for third in the ASUN championship tournament last weekend. He was leading by a stroke after the first round. Rain washed out the second round, shortening the tournament from 54 to 36 holes. He wound up at 2-under 140. Defenseman Ty Smith, an alternate captain for the Spokane Chiefs during the 2017-18 Western Hockey League season, was captain of the Canadian team at the 2018 IIHF U18 World Championship tournament in Russia. The Canadians, who opened with a 6-4 win over Team USA and won Group A with a 4-0 record capped by a 3-2 overtime win over Sweden, suffered a 2-1 loss to the lightly-regarded Czech Republic in the quarterfinals to end their gold-medal bid. Smith did not collect a point for Canada. Gonzaga women’s tennis – Vlada Medvedocva, Chisinau, Moldova. Peter Showler, a native of England with more than 33 years of coaching experience, has been hired as association head coach of the women’s program at Eastern Washington, Eagles head coach Chad Bodnar announced. Showler, the executive and technical director of the Cook Inlet Soccer Club in Anchorage, Alaska, since January 2017, was head coach of the Idaho women’s program from 2005 to 2014, where he became the winningest coach in Vandals program history. He was an assistant at Portland State for three years before taking the Idaho job and has extensive experience at the club level. Published: April 28, 2018, 5:20 p.m.